Billionaire Elon Musk defied his doubters to beat Friday’s 100-day deadline and install the world’s biggest battery in the Australian outback. He’ll probably relinquish that crown by February. South Korea’s Hyundai Electric & Energy Systems Co. is building a 150-megawatt lithium-ion unit, 50 percent larger than Musk’s, that the company says will go live in about three months in Ulsan near the southeast coast. With battery prices tumbling by almost half since 2014, large-scale projects are popping up around the world. 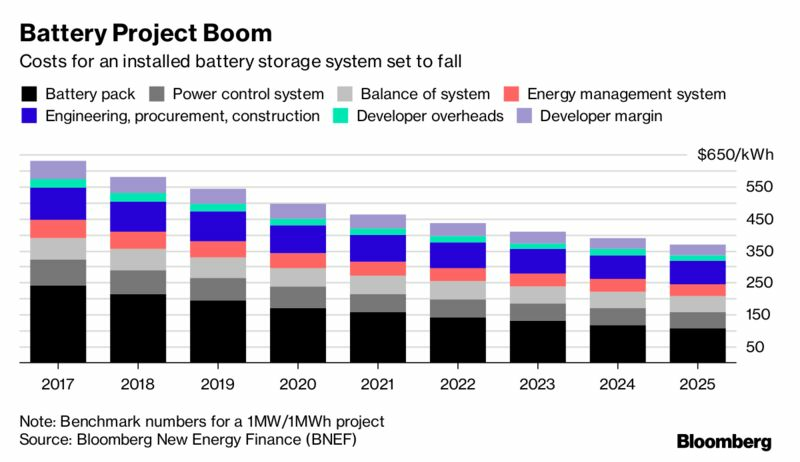 Developers have announced lithium-ion battery projects with total capacity of 1,650 megawatts per hour in 2017, four times the amount for all of 2016, according to Bloomberg New Energy Finance. Though Musk’s Palo Alto, California-based Tesla Inc. is best known for making electric cars, the company sells its lithium-ion batteries to utilities eager for cost-effective ways to integrate renewable sources of power like solar and wind into their electric grids. Musk agreed to up the stakes for South Australia, the mainland state with the biggest exposure to clean energy, by providing 100 megawatts of power, roughly the size of an electricity shortfall the region suffered in a February blackout. His nimbleness in delivering the entire project before the summer deadline has won him fans among local politicians. South Australian Premier Jay Weatherill, who features a photo of Tesla’s giant battery on his Twitter profile, used Musk’s star power to help sell his pitch for the state to be a world leader in renewable energy. With the battery sending power to the national energy market on Friday, Musk beat a Twitter bet that he could deliver the storage system within 100 days — or he would foot the bill. The entrepreneur also met a target set by the state government of installing the battery by the start of summer, Dec. 1, South Australian Premier Jay Weatherill said in a statement. The battery-storage industry is becoming increasingly important in places like South Australia, which has less access to traditional fossil-fuel sources like coal and gas than the rest of the nation. Instead, the region gets 41 percent of its electricity from renewable energy, one of the highest penetrations of wind and solar in the world. Smoothing out the intermittent nature of those sources when the wind dies down and the sun stops shining has traditionally rested with natural gas “peaker” plants that can fire up to meet demand at night and in the early morning. Now with the cost of batteries falling, large projects can be deployed within three months to meet that need. Big renewable-energy companies AES Corp. and AltaGas Ltd. have already dabbled in the large-scale energy-storage market. Others such as NextEra Energy Inc. and E.ON will soon produce battery packs that are cost-competitive, said Sam Jaffe, a battery analyst at Cairn Energy Research Advisors in Boulder, Colorado. While Tesla’s head start on the competition is a coup for Musk, rivals will be able to deploy batteries in similarly rapid time-frames, especially as the market becomes increasingly competitive, according to consultancy Wood Mackenzie Ltd. Over time, the rapid deployment of battery projects will give way to greater competition over costs, according to Saul Kavonic, a Wood Mackenzie analyst based in Perth. 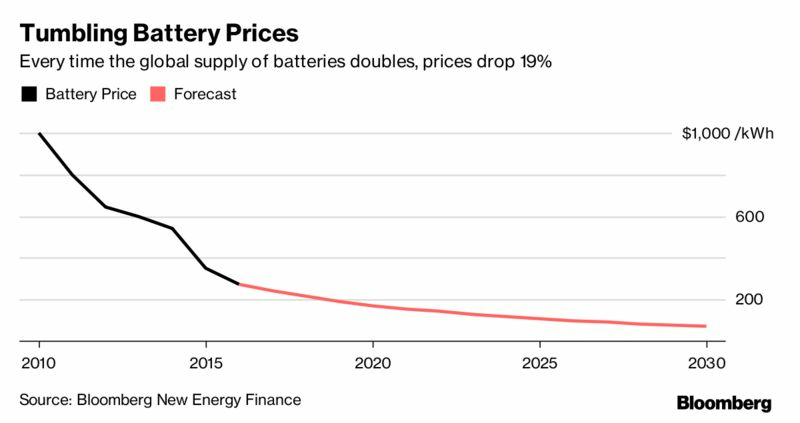 “Such rapid installation times should not become a defining feature of batteries’ competitive technology advantage in a well-structured market, but rather battery costs and flexibility that will improve with time,” Kavonic said.